Today’s content marketing space is a tumultuous one. Content shock, ever-changing search engine algorithms, social media’s midlife crisis, growing consumer distrust in brand messaging—marketers are constantly challenged to adapt and scale their strategies to simply bolster visibility, nevermind reach objectives and prove ROI. Emerging from the noisy marketing mix is a promising strategic marketing star that can capture the attention of hard to reach buyers, improve audience engagement, bring insightful perspectives to the forefront, and build brand trust and credibility. Of course, I’m talking about influencer marketing. At TopRank Marketing, we see credibility, value, and opportunity in influencer marketing; people crave credible content. And we also see authenticity, relevancy, and thoughtfulness as defining characteristics of the modern approach to influencer marketing—we call it Influencer Marketing 2.0. Our own resident marketing influencer and CEO, Lee Odden, has been evangelizing influencer marketing inside and outside company walls since 2012, before the practice in the content marketing realm went boom. Lee’s been named the No.1 “Influencer Marketing Influencer” by Onalytica, and his expertise on the subject has been featured on top industry publications including CMO.com, Forbes, and Social Media Examiner. Lee was also instrumental in the Influence 2.0 research report in partnership with Traackr and Brian Solis of Altimeter Group. So, what is the “Influencer Marketing 2.0” approach? 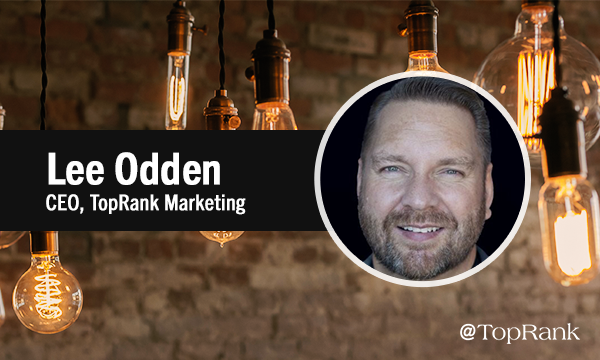 Let these words of Lee Odden wisdom—words that have defined how we’ve architected our influencer marketing manifesto—lend some guidance, focus, and inspiration to your influencer marketing efforts. Content is the foundation of marketing. Period. But marketers repeatedly cite that consistent creation of strategic, quality, engaging content is a top marketing challenge. When you co-create content with influencers, you not only provide influential experts with a medium to share valuable insights, but can also provide your audience with a mix of perspectives—upping your storytelling capabilities and credibility. In addition, some influencers already have a desire and knack for creating content, so an opportunity to collaborate will be welcomed and beneficial to your business. However, it’s also important to note that co-created content isn’t inherently valuable or set up to drive gangbusters marketing success. Value and relevance is certainly in the eye of the beholder—your audience. As a result, you need to stay true to your audience and your influencers, which requires an integrated approach that includes SEO and other proven content marketing tactics. Content planning software company DivvyHQ* took their marketing the “back to the future”, launching a long-running campaign that included a sequence of connected content marketing campaigns featuring relevant influencers. The SaaS company secured contributions from top content marketers for campaigns that resulted in significant increases in credibility and engagement. Additionally, the campaigns exceeded performance goals and added to DivvyHQ’s bottom line. The end result was this interactive eBook asset. Your brand, industry, product or service, and audience is undeniably unique—and influence varies. Furthermore, it may be easier than ever to give the perception of influence. After all, Twitter’s recent purge of suspicious accounts sent some individuals’ follower count into a landslide. However, the potential is there to validate and build relationships with relevant, experienced individuals—inside or outside your organization; broad expertise and niche knowledge; large or intimate yet engaged followings—who have the ability and willingness to affect action. At its core, influencer marketing is all about brands engaging and developing relationships with individuals—individuals who have relevant topical expertise, reach, and resonance that aligns with the goals of the brand. And your work shouldn’t stop after the first collaboration. You need to keep connections hot and mutually beneficial. In addition, for those more niche experts or rising stars, you can help them create more influence for themselves and your brand. Prophix*—a leading provider of corporate performance management (CPM) software solutions—combined original research with influencer content to create crush-worthy content marketing force. With an interactive quiz, with influencer micro-content featured throughout, serving as the anchor asset, additional tactics such as long-form influencer interviews, email marketing, and more, rounded out this campaign. The results? In the first 45 days, the anchor asset landing page garnered a view rate six-times higher than the benchmark for a similar resource. It was also the fourth most trafficked page—behind the Home, About Us, and Privacy pages. Whether you’ve cultivated warm relationships or you’re hoping to go beyond social engagement with the first collaboration ask, your success in securing their partnership is grounded in showcasing the mutual value proposition. Some thought leaders want to bolster or grow their influence, while others simply want to create something their proud of (or their bosses can take pride in). Regardless, be transparent, make sure your ask is relevant, and lead with the value. Specifically, when it comes to colder relationships, don’t ask too much too soon. There are obvious business benefits to working with influencers. Not only do they lend authority and credibility to your content and brand, but they also hold the power to introduce you and your content to their audiences. Once your co-created content is ready to be released into the wild, at a minimum, provide influencers with the messaging and visuals they need to easily promote on their channels. In addition, make sure the final product lives up to its full potential. Regardless of their intentions for participating, if they’re going to share content with their followings, they need to be proud of it. There are few better examples of this principle in action than SAP’s* interactive microsite designed to help launch their Leonardo platform. Thirty-two influencers were engaged to share their insights on digital innovation topics from blockchain to machine learning. The content experience was so compelling for the influencers that the share rate was 100%. In fact, several influencers shared multiple times. The content experience was engaging for the audience, too—the microsite had over 21 million social impressions. Whether you love, hate, or question the potential of influencer marketing, it’s undoubtedly on the rise. It’s enjoyed a couple years of big hype, but now is the time to decide if it should be a trusted part of your integrated marketing strategy. Use these guiding principles and snackable quotes from a pioneer of the craft to help you define what influence means to your brand, and opportunities for collaboration and co-creation. So, go forth and put your newfound influencer marketing wisdom into action. Remember how we said that influencers add credibility to your content? Learn how three brands co-created more credible content to drive awareness, engagement, and action. If you still want more influencer marketing insight, join Lee along with TopRank Marketing Digital Strategy Director, Ashley Zeckman, at their CMWorld sessions to learn how influencer marketing can grow your business. Get the details here. *Disclaimer: DivvyHQ, Prophix, and SAP are TopRank Marketing clients.